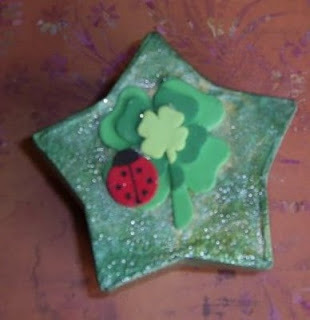 This is the February UHU glue project - A sweet star-shaped box to fill with more candy for St.Patrick's Day. I began by glueing the green paper along the side of the box, then spraying green and gold mica paints on the cover. 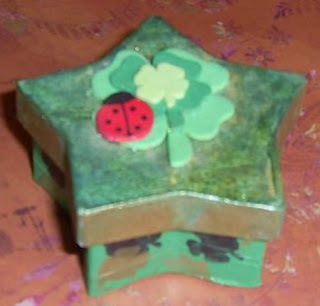 I then painted the box top with crackle paint and when dry, added a bit more sparkle with clear glitter paint. 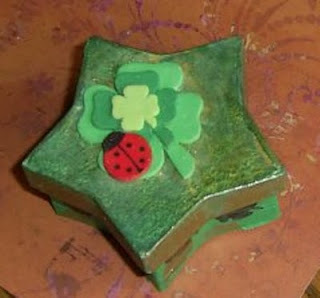 I then took one of the foam clover leaf cutouts and stamped the sides of the box with black and gold paints. Boy, it sure is difficult to get a good pic of this box!! arghhh. I glued three various shapes of the foam leaves plus the cute as ever ladybug piece, all together with the UHU Gluestick, then glued that to the top with the twist and glue. I am amazed at how well the foam pieces stuck together with the UHU gluestick. Did not know that UHU stick could glue these kind of materials! Thanks for sharing!